1. Tour de Mont Blanc. 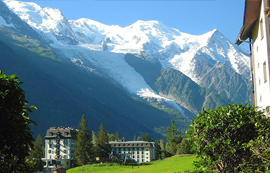 Just about every list of trekking destinations in France will mention Mont Blanc, which is the highest peak in Europe. The views are amazing, with giant glaciers, azure alpine lakes, and luscious green valleys. The trails are marked and well-maintained, and iron ladders are securely bolted on the side of the mountains. You may also see some wild ibexes and chamois along the way. If fatigue sets in, you can still enjoy the view by taking the chair lifts and cable cars. But walking also has its charms, since the refuges along the way will fill you up with fabled French food and wine while you take supplies and food to go. 2. GR20. Built in 1972, this Corsican path connects Calenzana in the Balagne, to Conca north of Porto Vecchio. You won’t be traipsing through the path, though. The rock faces can be slippery, the bridges can seem a bit flimsy (to say the least), and the path itself is rocky and steep in some places. Still, the reward is great. The diversity of the landscapes offered by the GR20 is undeniably wondrous. You’ve got plains and forests, moonscapes and craters, glacial lakes, peat bogs, peaks and stretches of ice. 3. Via Podensis (GR65). This hiking route allows you a similar experience of what pilgrims had to go through in the 10th century. There are four main pilgrim routes, and along the way you’ll stop over cathedrals, churches, and abbey – plus restaurants, of course. You can try the Le Puy route, which is about 736 kilometres long and will take you about 5 weeks to cover. The terrain can vary a lot, but it’s quite strenuous and it’s almost never flat. You can go at any time of the year, but April to June and September to October are recommended. 4. Alsace Wine Trail. For beginners, this easy to walk trail also needs about five days to complete. The woodsy allure of the Rue du Vin is accompanied by a trek with a bit of wine tasting along the way. You visit Bergheim, Turckheim, Riquewihr, and Kaysersberg easily by walking just 17 kilometres a day. If you can’t stand long, arduous treks, then this is perfect for you. But before you embark on your journey, you may want to consider getting some Globetrekkers travel insurance first. These hiking routes can really demand a lot from you, and if you get into an accident then at least you have some insurance to cover you. You’ll need a healthy body and a stout heart for these journeys, and the Globetrekkers travel insurance can give you the peace of mind you’ll need.